in how many day i can see through third eye. how much time to practice. what to practice.what to chant. Well to be honest I depends on a few things…. Do you meditate? Do you have fluoride in your water? You must meditate! And you must get rid of the Fluoride! Then its just a matter of time. 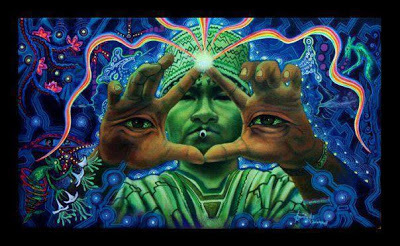 You probably do sometimes already see through your 3rd eye but you’ve not been taught to use it. Most are taught to ignore it! Please check my meditation page if you need help with this. I’ve always had a nag for feeling other people’s energy and what vibe they give off. I’ve even freaked a couple people out (not on purpose) because i can tell what they’re feeling, because I can literally FEEL it as well. They ask me how I knew they were upset, angry, sad, etc… And I couldn’t really explain it, I was afraid to explain it but I’ve been this way for as long as I can remember. I’ve always questioned the idea of the Third Eye… But u have now made it very clear to me 🙂 I have been meditating a lot lately, so now I will try to see if I can tame my use of my third eye now that I know I’ve tapped into it before and see what other abilities it will yield for me and others around me! Thank u! How do you know if your water has flouride in it, also if it does what can you do differently, i usally drink water from the fridge or generic water brands. If you live America your water has flouride in. Most of the UK and most of Europe doesn’t but you should phone your water company and ask them. If yours does there are loads of filters you can get. I’ve got the 5 stage reverse osmosis filter system and you’d be amazed at the crap it filters out of the water they send to your house to drink! Google search it for your self. I’m in London UK and you’d think our water is pretty good, think again. It cost me about £120 and it was the best £120 I’ve ever spent! Be careful as some bottled water has it in too. Once again google search flouride free bottled water, there’s not that many.